If you missed the screening of TEACHED hosted by the Mason Square Health Task Force on 2/19, you'll be happy to know that the first volume of short films is available to watch on-line: http://www.teached.org/. From the film's website: TEACHED is a short film series that candidly assesses the causes and consequences of our nation's race-based “achievement gap," looking at continuing inequalities in our public school system and taking viewers into those communities where the effects are most severe to hear what solutions the students, parents, teachers and others have to offer. My colleague Cynthia and I are in the midst of delivering IISC’s newest course, Fundamentals of Facilitation for Racial Justice Work, here in Springfield, Massachusetts. Together with a group of dynamic and committed change agents, we are engaged in hands-on exploration of a variety of process and content tools so that we are able to better serve as facilitators towards the ends of racial equity and justice. Part of our discussions today will focus on how we can maintain our center amidst triggering situations and use our identities to advance the work. One very useful tool to this end is the Ladder of Inference, which is based on material from Chris Argyris in his work Overcoming Organizational Defenses. 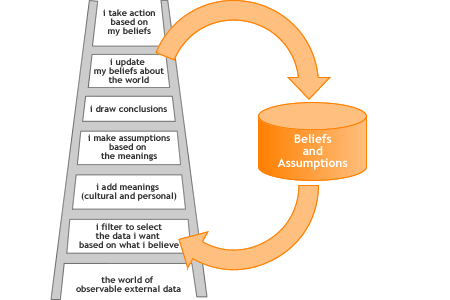 The Ladder is both a metaphor and a model for understanding how people create meaning and sometimes jump to incorrect conclusions about what others have said or done. The Ladder illustrates how our actions really come down to an underlying process of selective perception. How we perceive our relationships with others is significantly affected by an unconscious selection process, which can cause conflict in and damage our relationships when we act as if our perceptions are the truth. Invoking the Ladder can help remind us that our truths are based on assumptions and self-generating belief systems that may require closer examination and alteration. Something useful to this end is a set of questions that can help us (through self-reflection) or others (through inquiry) “come down our ladders” and see what rung or rungs may be tripping us up. What resulted from my/your action? How did that match/mismatch my/your intention? Am I/Are you assuming that . . . ?/I assume that . . .
What caused me/you to decide that . . . is true? What does it mean to me/you when . . . ? Do I/you feel certain that . . . ? How was I/were you feeling when . . . was said or happened? What might I/you have missed? What did I/you see hear? What other ideas do you have? How have you effectively managed yourself and helped others to self-manage so that we might better be instruments for justice? A huge "Thank You!" 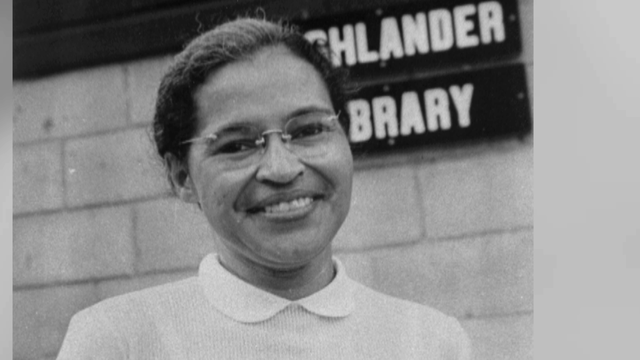 to Ernesto Cruz for digging up this four-part documentary about Springfield during the Civil Rights Movement.